Even though it's quick and there's only one rising, you will use regular active dry yeast - NOT rapid-rise yeast. I reduced the salt slightly because I found 2 teaspoons to be too much for my taste. 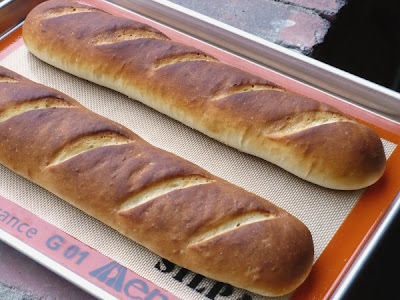 The recipe also calls for brushing the loaves with butter half-way through baking. I did this the first time and didn't like how it made the crust kinda soggy. So I leave that step out now, though you are welcome to do it if you want. These loaves are dense, but not too dense, and soft inside. The crust is not a thick, crispy crust (just in case you were looking for that). Don't forget the pan of water on the bottom rack of the oven! In a small bowl, mix the warm water with the yeast and sugar; let sit for about 5 minutes - it should become foamy on top. In a large mixing bowl, combine 3 1/4 cup flour and salt. Gradually add the yeast mixture and mix until the dough comes together in a ball, adding more flour as needed. Turn out on a lightly floured surface and knead for 5 minutes, or until smooth and elastic, adding a little flour here and there just to keep it from sticking. Cut dough in half. Roll each half into a long rectangle and roll up lengthwise; pinch edges to seal (I also turn under the ends so they look smooth). Place on a baking sheet lined with a Silpat or parchment paper. Repeat with other half of dough. Cover and let rise for 30 minutes. Place a rimmed baking sheet on bottom rack of oven and fill with 2 cups of boiling water. Preheat oven to 450 degrees. While the oven is heating, take a sharp, serrated knife and cut 4 or 5 slits across top of each loaf. When oven is hot, bake loaves for 15 minutes, brushing loaves with melted butter half-way through baking time, if desired. Let loaves cool at least 5 minutes before slicing. If you spray the inside of the oven (right when you put the bread in) with water it will make the crust crunchy. Just use a water bottle.